Net worth of Americans dropped a lot over the past 12 months. But there is still a significant amount of wealth in the USA. How does your net worth stack up to other Americans? Census data on net worth from 2002 is the latest that I can see that breaks it down into different net worth amounts. THis is a bit old but I doubt the overall trends have changed radically since then. As you can see 17% of Americans have a net worth of $0 or less. Those folks have debts that are more than their assets. The top 20% of Americans have over $250,000 in net worth. 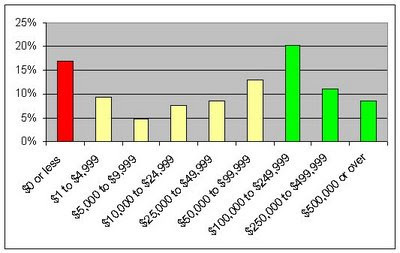 Most Americans fall somewhere in the middle with 63% of us having a net worth between $1 and $249,999. These figures are for ALL Americans and it doesn't look at how net worth varies based on age and income levels. Generally speaking younger people have lower net worths and people with lower income have lower net worth as well.